Krijg een uniek zicht op de schatten van de IJslandse Highland-regio tijdens deze mooie luchttour vanuit Akureyri. 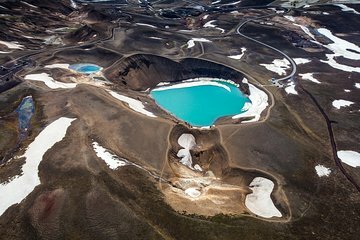 Zweven boven Askja caldera, oefenterrein voor NASA-astronauten; Mt Herthubreith en de Vatnajökull-gletsjer, de grootste en meest omvangrijke ijskap van IJsland en de grootste gletsjer van Europa. Tijdens de vlucht ervaar je ook de aanblik van lavavelden en watervallen vanuit de lucht, waardoor je een ongeëvenaard perspectief op de IJslandse natuur hebt, weg van de toeristische drukte. Great experience to see the Glacier, lava field, volcano, power plant, Waterfalls of the Gods and we landed on a landing strip and got to walk around. Great comfortable plane everyone had a great view. They picked us up in town and drove us back. The view from Airvan was fantastic, I would recommend it to everybody. Our voucher stated the tour starts at 10:00 am. We arrived Akureyri from Reykjavik by the domestic flight at 9:00 am. We rented a car, rushed to Circle Air the tour provider and found the door was locked, there was nobody there. I called the number posted on the door, the provider told me the tour is 12:00 am. It was apparent that there was a communication error between Viator and the local provider. We had to wait outside for 20 minutes until Circle Air people arrived. It was very windy that day, they advised us we could wait until 12:00 am the time Circle Air scheduled the tour or wait until the next day to see if the wind would calm down. We decided to drive around that day and waited until the next day. The Circle Air called me and gave us a private flight next morning, it was a spectacular trip. They were sincere, very friendly people. We wished Viator had a better communication with the Circle Air and notified us ACCURATE DEPARTURE TIME so we didn't have to rush.